SWTOR 4.0 Watchman Sentinel PvE Guide by Oofalong. This guide was adapted from Oofalong’s Annihilation/Watchman Compendium for 4.0. 1 What is New in 4.0? 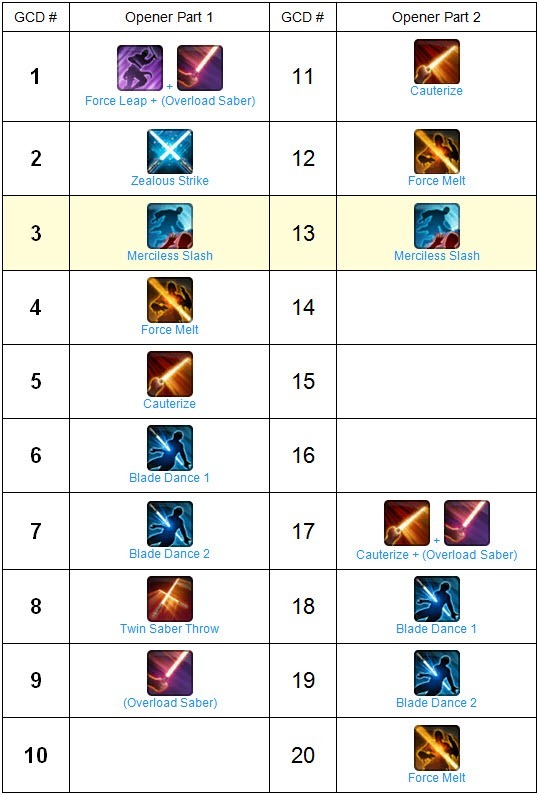 Overall, Watchman is one of the best sustained single target DPS builds in SWTOR. The SWTOR Devs have stated they intend for it to be the highest sustained damage spec for Sentinels. In addition, the build offers high survivability due to a passive proc self-heal. A properly spec’ed and built character will do ~50% of their damage as DoTs. Marauders deal bleed (internal) damage while Watchmen deal burn (elemental) damage. This spec is melee exclusive and suffers from poor burst damage, and its area-of-effect (AoE) potential is less than other classes. Also, it is a very mobile class as nearly everything is an instant ability. Unique Primary Stats – Strength, Willpower, Cunning & Aim – have been removed and replaced by Mastery. This has minimal impact on the game as primary stats effectively behaved the same. It will make sharing legacy gear easier as now only Set Bonuses differ. Surge Rating has been removed, and Critical Rating now increases Critical Multiplier. Any critical chance over 100% will be converted into additional Critical Multiplier. This will be most noticed on attacks that have a 100% critical chance like DoT ticks under Zen, Immaculate Force buffed Clashing Blasts, and Felling Blow buffed Force Sweep or Focused Burst. The crit formula has been changed as well. Our Critical Damage Multiplier is increased by our Critical Chance in excess of 100%. For example, consider the DoT on Cauterize, imagine its Critical Chance is 50% and its Critical Multiplier is 70%. Zen increases the Critical Chance by 100% for a total of 150%; this excess Critical Chance now increase the Critical Multiplier. Specifically, its Critical Multiplier will increase by 50% to 105% (1.05 = 0.7 * (1 + .5)). The accuracy formula has been changed; we now require less Accuracy Rating to reach our target of 9% (assuming 1% companion buff), specifically a rating of 685. All basic attacks – ours is Strike – now have base Accuracy of 100%. This simplifies Accuracy. Now instead of 5 different Accuracy measures we have 3 – Main Hand, Off Hand, and Force. Knights of the Fallen Empire (4.0) introduced numerous changes to the spec and playstyle of Annihilation | Watchman. I believe the spec has been vastly improved. While still different from its 2.X version, it retains the most important hallmark: It is easy to play, but difficult to master. Plus, the discipline has returned to its short DoT duration with formidable direct attacks. Force Melt: This ability has been significantly redesigned. It now builds resource, it has a CD, and its DoT duration has been reduced. Plus, its damage has been reduced. The various passives in the discipline path make this a direct replacement for Force Leap; it builds 4 resource and has a 12s CD. Cauterize: The DoT duration has been increased to 9s and it now ticks every 3s. It’s DoT damage has been increased. Blade Dance: Master Strike was renamed Blade Dance so put on your dancin’ shoes. Force Leap: This ability no longer plays an integral role in the discipline. It can now exclusively be used as a gap closer. Generally, the buffs previously to this ability now buff Force Melt. Blade Blitz: This is a new ability although its low damage means it will not be rotational. We will still use it primarily as another gap closer. This was reworked for 4.0 given the changes to Force Melt although little else changed. We have a new passive that increases damage dealt post Merciless Slash for a brief period of time. Burning Sweep 12 Reduces the cooldown of Force Sweep by 9s and the focus it consumes by 1. In addition, Force Sweep deals 30% more damage and spreads your Cauterize and Force Melt burns to targets it hits, if it hits a target already affected by those bleeds | burns. Repelling Blows 16 Force Melt builds 1 additional rage. Hastened Melt 20 Reduces the cooldown of Force Melt by 3 seconds. Searing Saber 24 Increases the critical strike damage of your burn effects by 5%. Juyo Mastery 28 Your burn effects are 2% more likely to critically hit per stack of Juyo Form. 32 Increases the direct damage dealt by Cauterize by 5%. Merciless Zeal 36 Critical hits with burn effects heal you for 1% of your maximum health. Plasma Blades 40 Your Cauterize, Overload Saber, and Force Melt burns heal you for 15% of the damage they deal. Burning Focus 44 Your direct damage attacks that critically hit a burning target build 1 focus. This effect cannot occur more than once 3 seconds. In addition, Merciless Slash makes its target assailable for 45 seconds. Assailable targets take 7% more elemental and internal damage. Inexhaustible Zeal 48 Juyo Form can now stack up to 6 times, and Merciless Slash can now stack up to 4 times in total. Mind Sear 52 Your burn effects have a 20% chance to grant Mind Sear, which increase the damage of your next Twin Saber Throw by 100%. This effect can occur once every 18 seconds. Blazing Ward 56 Dealing burn damage to a target increases your damage reduction by 5% for 3 seconds. Accelerating Victory 59 Juyo Form and Merciless build two stacks at a time. In addition, Merciless Slash has a 50% chance to build Accelerating Victory when activated, increasing the damage your next Slash or Dispatch deals by 5% per stack. Stacks up to 2 times. Smoldering Burns 64 Merciless Slash increases the bleed damage you deal by 5% for 4.5 seconds after use. At level 65 you will be able to invest in seven of these talents. I have highlighted the talents that will generally be the most worthwhile for PvE although you can’t take them all. Thus, you will need to adjust them based on each fight’s required mechanics and/or damage profile. I think there are a few that are always beneficial: Stoic, Force Fade, and Contemplation (although you can spec out of this after building 30 stacks of Centering). In addition to these three, my standard build also includes: Jedi Enforcer, Jedi Crusader, Defensive Roll, and Expunging Camouflage. Jedi Enforcer Increases the damage dealt by Rebuke by 15% and increases its duration by 4 seconds. This is one of the many buffs to Rebuke. Debilitation Blade Dance immobilizes the target for the duration of the ability. This is one of many abilities that immobilizes/slows your target, which has little to no effect in PvE. Jedi Crusader While Rebuke is active, it generates 1 Focus whenever you are attacked. This effect cannot occur more than once every 2 seconds. This is one of the many buffs to Rebuke. Adamant You generate 4 Focus when stunned, immobilized, put to sleep, or knocked around. Additionally, the CD of Unleash is reduced by 30s. This has situational benefits. Stoic Increases damage reduction by 2%, and you build 2 Centering when attacked. This Fury building effect cannot occur more than once every 1.5 seconds. This is always beneficial. Trailblazer Cyclone Slash deals 25% more damage. While this sounds great for clearing trash mobs, the cost of the ability still makes this fairly unattractive for this Discipline. Reining Reach Increases the range of Crippling Slash to 10m. Additionally, Crippling Slash consumes 2 less rage. Minimal PvE application. Unwavering Resolve While Saber Ward is active, you are immune to stun, sleep, lift and incapacitating effects. This has situational benefits. Incisor Force Leap, Force Melt, Clashing Blast, and Zealous Leap snare their target, reducing its movement speed by 50% for 6 seconds. This is one of many abilities that immobilizes/slows your target, which has little to no effect in PvE. Ardor Transcendence no longer requires or consumes Centering, but will go on CD for 30s when activated. This has situational benefits. Defensive Roll Reduces damage taken from area effects by 30% and increases internal and elemental damage reduction 5%. This has situational benefits, but many of the fights in the current Operations have AoE damage making this pretty useful. Watchguard Reduces the cooldown of Pacify by 15 seconds and Force Kick by 2 seconds. This has little to no effect in PvE. Pulse Reduces the cooldown of Force Stasis by 15 seconds. This is one of many abilities that immobilizes/slows your target, which has little to no effect in PvE. Displacement Increases the range of Pacify by 6 meters and allows Rebuke to be used while stunned. This has little to no effect in PvE. Force Fade Increases your movement speed by 15% and the movement speed bonus of Force Camouflage by 20%. Additionally, increases the duration of Force Camouflage by 2 seconds. This has situational benefits as it increases the utility of Force Camouflage as a gap closer. Inspired Focus Bloodthirst generates 12 rage when activated. Fleetfooted When Transcendence is applied or refreshed, it purges movement-impairing effects. Additionally, the movement speed bonus of Transcendence is increased by 30%. This has situational benefits. Expunging Camouflage Force Camouflage removes all cleansable effects when activated. There are many cleansable debuffs found in Operations so this is a great utility. Jedi Promulgator Each use of Strike, Zealous Strike, and Leg Slash reduces the active cooldown of Rebuke by 3 seconds. This is one of the many buffs to Rebuke. Just Pursuit Leg Slash immobilizes that target for 3 seconds. This immobilizing effect cannot be applied to the same target more than once every 10 seconds. This is one of many abilities that immobilizes/slows your target, which has little to no effect in PvE. Enduring Increases the duration of Guarded by the Force by 2 seconds. Reduces the cooldown of Guarded by the Force by 30 seconds. While this is obviously beneficial any boss strat that relies on Guarded by the Force is flawed. Zealous Ward Getting attacked while Saber Ward is active heals you for 3% of your maximum health. This effect cannot occur more than once every 1.5 seconds. This has situational benefits. Contemplation Reduces the cooldown of Awe by 15 seconds. In addition, you build up to 30 Centering over the course of using Introspection. This effect cannot occur more than once every 30 seconds. Being able to pre-stack Centering before a boss fight is a welcome addition to the Discipline. You can also spec out of this once you have built your stacks. Cut Loose Blade Blitz can be used while immobilized and purges movement-impairing effects when activated. This has situational benefits. Plasma Blades: This proc has a 20% chance to generate resource from each tick of our burns, but can only happen every 1s. Burning Focus: This proc generates resource when our melee hits crit against a burning target but can only happen every 3s. We should have 100% uptime considering all three of our burns and several of our abilities hit the target multiple times so we are able to generate considerable resource this way. This has a slight edge in resource generation compared to Plasma Blades. We now have a more priority rotation compared to the 3.X rotations made possible by the additional resource as well as the increased CD on Merciless Slash. Ideally, we use our biggest hitting abilities on CD, while filling the remaining GCDs to maximize damage and ensure we have the resource for our core abilities. Personally, I reorganized all of my keybinds and retrained myself to avoid falling into the comfortable routine of the past rotation. In order to achieve our steady-state priority rotation, we need to reduce the CD of Merciless Slash with two uses of the ability thanks to Accelerating Victory. Thus, our opener spans 30s/20 GCDs. Unlike many classes we will not be doing our peak damage during this opener as we have to build stacks of Merciless and Juyo Form plus we need to get to the 9s CD for Merciless Slash. The open cells are filler and will vary between Zealous Strike, Strike, and Slash. Our core abilities have a cooldown (CD) of 9s (6 GCDs) or some multiple of this with the exception of Force Melt, which has a 12s (8 GCD CD). 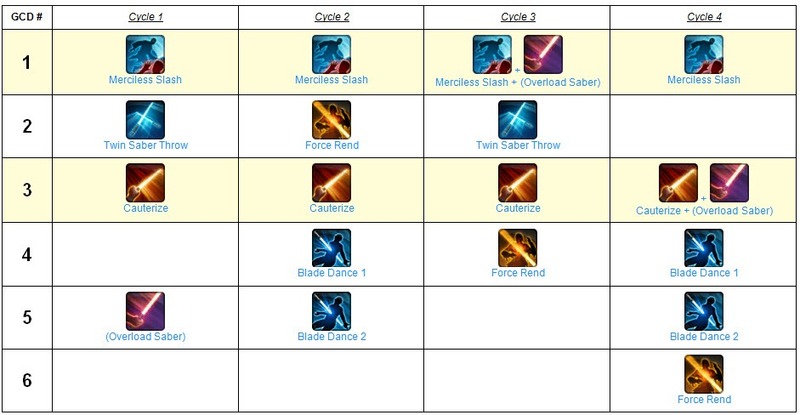 (Overload Saber has a 12s CD (8 GCDs), but it is off the GCD which means we are indifferent to how it shifts within our rotation.) Thus, we need to balance two seemingly different CD cycles; however, by following the proper sequencing we can ensure that none of our priority abilities conflict. In aggregate we can outline a 36s (24 GCD) rotation although for practical purposes it is much easier to think about 9s (6 GCD) priority cycles. Each cycle starts with Merciless Slash and features Cauterize in the 3rd GCD. Other than this our priority abilities are used as shown below. The open cells are filler and will vary between Zealous Strike, Strike, Slash, and Dispatch (in execute range). Due to the increased amount of resource expect to be using Slash a lot and very rarely use Strike. Further, you will basically use Zealous Strike on CD as long as it does not delay the use of one of the higher priority abilities. This priority rotation and sequence allows us to use every one of our priority abilities on CD, which is fantastic. Nearly every use of Twin Saber Throw should benefit from the Mind Sear buff. Even if it is not buffed do not delay its use. This rotation should provide 100% uptime on Cauterize. which is necessary to benefit from Burning Focus. Once your target falls below 30% you gain access to Dispatch; this becomes your highest priority filler (resource permitting). In other words don’t risk delaying any of the higher priority abilities. We don’t have an AoE rotation per se, and depending on the health of the targets we need to determine how many DoTs to spread via Force Sweep. For weaker mobs just spread Cauterize, and for bigger mobs you will want to spread will want to also spread Force Melt. GCD #4 in Cycle 2 and GCD #5 in Cycle 3 are ideal times to DoT spread. Zen: Given the number of DoTs we have, it can be difficult to maximize your 3-stack ticks of Overload Saber although it is still optimal to do so. On a dummy parse you will be able to use this approximately three times every two 24 GCD cycles. You should aim to use Zen right after Force Melt. Rebuke: Timely use of this will provide a good DPS boost as well as extra resource to help you maintain your rotation. This performs best with steady amounts of incoming damage like those found in Temple of Sacrifice’s The Underlurker. Adrenal: Try to overlap your adrenal use with Inspiration as well as Zen. and the choice augments offer. Thus, if we take the token pieces as is, including Earpieces & Implants with Alacrity, we’ll have the ideal allocation of Alacrity. We will be slightly over on Accuracy and slightly under on Critical, but given the volume of enhancements available this is easy enough to correct. Simply, change one Accuracy slot for a Critical Slot, and you’ll achieve the ideal balance. This will technically put us a bit under with 216 gear, but with 2x 220 enhancements this will be corrected. I encourage you to review Bant’s excellent work for more details. Mastery is effectively now the universal main stat. Armorings, Hilts and Mods as well as our Earpiece and Implants provide Mastery. We may also gain Mastery via Augments. Mastery boosts Damage Bonus by 0.20 per point, and it contributes to our Critical Chance or Crit %. Power is effectively now the universal secondary stat as Critical Rating has been removed from Mods. We will also gain Power from our Earpiece, Relics, Implants and Enhancements. We may also gain Power via Augments. Power boosts Damage Bonus by 0.23 per point. (I expect the community to adopt a better naming convention for this, perhaps Enhancement Stats.) We now have three stats that share a budget: Accuracy, Alacrity and Critical. These stats are found on our Earpiece, Implants and Enhancements. We may also gain any of these via Augments. Accuracy Rating: This increases our attack’s chance to hit. You can earn a 1% legacy-wide accuracy boost by reaching max affection with Broonmark | Lord Scourge or a melee tank DPS companion on any of the other characters in your legacy. Operation bosses also have a 10% defense chance or chance to avoid your attack, which means we want our Accuracy to be 110% to ensure we never miss with our heavy-hitting abilities. (We will still be below this target for our OH so you will occasionally see misses here.) The exact Accuracy Rating needed is 684. Alacrity Rating: This effectively allows us to go through your rotation more quickly. It will increase the speed with which your DoTs tick as well as shorten your GCD and the CD of abilities. Critical Rating: With the introduction of 4.0, this stat determines both the likelihood of critical hits as well as the total damage of your critical hits. You can earn a 1% legacy-wide critical chance increase by reaching max affection with Sgt. Rusk or a ranged DPS companion on any of the other characters in your legacy and a 1% legacy-wide critical damage boost by reaching max affection with Kira or a melee DPS companion on any of the other characters in your legacy. I believe the following augments are your best choice for 216 through 224 gear. You will be a bit under the Accuracy target in 216 gear, but this way you won’t have to worry about swapping any of your Augments out as you advance tiers. You will want equip the best Serendipitous Assault & Focused Retribution relics you have access to. Review this analysis for specifics on relics. I have not reviewed this considering the changes in 4.0, but I do not expect there will be a difference. Set bonus were broadly redesigned in 3.0. There are now seven qualifying slots: Head, Chest, Bracers, Gloves, Belt, Legs and Boots. And, there are now benefits for 2, 4 and 6 pieces. As before they are cumulative such that if you have the 4-piece bonus you also have the 2-piece bonus. 2-piece: Zealous Strike increase damage dealt by 2% for 15s. Cannot occur more than once every 30s. 4-piece: Reduces the cooldown of Valorous Call by 15s. Additionally, activating Zen increases all damage dealt by 3% for 10s. 6-piece: Activating Master Strike or Twin Saber Throw will grant Weaponmaster’s/Challenger’s Critical Bonus making your next Dispatch, Concentrated Slice or Merciless Slash critically hit. This can only happen once every 60s. Assailable: Increases damage taken by 7% from internal/elemental sources; our DoTs are internal/elemental. Beat Down: Increases melee attack damage by 5%; all of other other core attacks are melee attacks. Vulnerable: Increase force attack damage by 5%; our DoTs are force attacks. Sundered: Reduces target’s armor by 20%; this reduces the damage mitigation our melee attacks suffer from the target’s armor. You must be in Juyo Form. Once you enable this form you stay in it until you disable it. For a properly spec Sentinel, Juyo form does many things. First off, it increases attack damage by 1% up to 6 stacks with the Inexhaustible Zeal. Further, each stack of Juyo Form increases the critical chance of our DoTs by 2% up to 12% via Juyo Mastery. Using Zen when in Juyo Form makes our next six DoT critically hit automatically. In short, if you are not in Juyo Form as a Watchman Sentinel you are doing something wrong. An attack’s critical chance is a function of Critical Rating and Mastery. Each of these inputs contribute based a different exponential equation, which means the diminishing marginal rate of return varies. Said another way, there is no such thing as a Crit % DR. You should not think about a target crit %; instead you should target a certain Critical Rating to compliment your Mastery. Everyone has a base 5% critical chance and the Imperial Agent | Smuggler class buff grants another 5%. You can also earn a 1% legacy-wide critical chance boost by reaching max affection with Vette | Sergeant Rusk or a ranged DPS companion on any of the other characters in your legacy. This provides an effective base 11% critical chance. Plus, we can add additional critical chance from Mastery of at least 8%. This gives us a total melee crit chance of almost 20% with 0 crit rating. Anytime we activate an ability that spends Focus we will build 4 stacks of Centering. Plus, any time we kill something we build Centering. And, Defensive Forms will grant us 2 Centering when we are attacked. Once we have 30 stacks of Centering we can use a few different abilities. The exact number of Zen uses varies fight to fight. For instance, practicing on the training dummy, we must use eight Focus consuming abilities to build 30 stacks of Centering. The most commonly used ability with 30 stacks will be Zen, which causes our next 6 burns to automatically critically hit. Plus, each of these 6 ticks will also heal your 4 person group for 1% of their max health. Zen will always increase our DPS, and well-timed use of it can dramatically increase our DPS. I think there are worthwhile mechanics to understand even if you don’t want to do your own theorycrafting. * These three attack components combine for one entry in your combat log. The ability’s tooltip will state if it attacks with both hands. There are two one-handed melee attacks Force Charge | Force Leap and Deadly Throw | Dispatch. Main Hand Damage is a function of the hilt in your lightsaber as well as Amount Modifier Percent (Amt Mod %). The tooltip of your hilt will list its minimum and maximum damage. This – plus the Standard Health Damage – accounts for the variance in ability damage. Off Hand Damage is by design 30% of main hand damage so every Off Hand Hit needs to be multiplied by 0.3. Melee Bonus Damage is a function of Mastery & Power. Our class buff boosts this damage by 5%. This amount is than multiplied by the coefficient of the ability. Force Bonus Damage is a function of Mastery, Power & Force Power. Our class buff boosts this damage by 5%. This amount is then multiplied by the coefficient of the ability. Standard Health Damage is standard amount based on the level when you last trained on the ability. This is why when you hit 50, 55, 60 and now 65 you re-train nearly every ability. This amount is then multiplied by the Standard Health % Min or Max. Read this and this to learn about modeling damage; the necessary inputs are here. My approach to theorycrafting combines modeling expected results based on relevant factors then analyzing actual results to ensure my model and hypotheses are accurate. Or, doing spreadsheet math and checking the combat logs to make sure it is right. Plus, I want to make my analysis and recommendations easy to understand. There’s enough complexity in life, and SWTOR shouldn’t be contributing more of it. Thus, for all of my conclusions and recommendations I can, and will if asked, explain the math and mechanics behind it. Where I cannot prove something, I may still offer my opinion and I will try to be clear when this occurs. I do not pretend to know everything, and when someone has a different perspective I attempt to understand their point of view and either incorporate it into my recommendation or dismiss it with data/facts. There are lots of potentially valid theories to optimize an Annihilation Marauder | Watchman Sentinel. However, I believe there is only one – or a very limited number of – truly optimized specs, gear, etc. I aim to identify the most optimal, yet also identify and quantify sub-optimal options. Each release or patch may include changes to class abilities. This is done to balance game play across all classes and roles. Since the game’s release there have been a number of impactful changes to Watchman Sentinels. Increased Merciless Slash‘s damage dealt by 7% as well as reduced its cost by one resource to 4. Corrected the double proc’ing relics which decreased DPS of this spec. Increased the duration of the Merciless buff to 24s. Eliminated Battlemaster Gear so now all PvP set bonuses are tied to armorings just like Campaign & Dread Guard. Merciless Zeal heals for 0.5% down from 1% per talent point. Guarded by the Force reduced to 4s. Master Strike uninterruptable and 15% more powerful. Dispatch usable for 30% and less. Force Camouflage reduces damage by 50% replaces Force Fade skill ability. Quick Recovery has been removed from the game. It reduced the rage cost of Sweep and Cyclone Slash by 1 and reduced the CD of Smash | Sweep by 1.5 seconds. Focused Pursuit has been removed from game; however, its effect – Increase Transcendence speed by 15% – has been added to Fleetfooted in the Combat tree. Focused Leap, which increases the resource generated by Force Leap, was moved from the Combat tree to replace Focused Pursuit place. Pacify cannot be used on Operation Bosses. Plasma Blades increases damage by 5% per point compared to 2% previously. So force melt was changed? So in a single year, there were 4 rotations we had to learn for watchman due to changes…. I’m so frustrated with the class. I mean, I do want to get back to being good at watchman, but can you imagine how demoralizing it is to learn yet ANOTHER rotation? … meh, I’ll get around to it eventually. Of course, by the time I finally learn it, Bioware’s gonna change it yet again. Yeah, I’m definitely enjoying watchman more now than I was prior to 4.0. I can actually play the game, rather than counting seconds all the time. I can confirm this. My first character was a Watchman, switched to Combat in 3.0. MANY people I knew either switched or abandoned the AC altogether. Now it’s fun to play Watchman again, still not what it was pre-3.0, but then again what AC is? Yes well said and 110% agree 🙂 I dislike a looot of simplification that 4.0 brought, but changes for Sentinel are very welcome. Except for having Monkey Spin hmm sry i mean Blade Blitz ability. Just think of it as an aoe dodge. Lets you keep hammering until the last second, then hit it and escape. Do you plan on making a PvP guide? No. A PvE guide is essentially an optimization problem with controllable variables. PvP is not this at all. Great guide! Only thing I noticed it that it looks like the old term Master Strike and the Imp term Force Rend have been used occasionally and need to be changed to Blade Dance and Force Melt respectively. Thanks for giving us the rep version my friend. Can you give us the chance to select a print view of your guides? Sure, I can print the page itself, a print view would be nicer to read as it will not have overflowing text here and there. Many thx for the guides Oofalong and Dulfy for hosting them. I find myself reading the guides several times in case something slips. As a matter of fact i managed to perfect my rotation, or priorities, by reading many times and digesting everything. Looks like I’ll have to get out my sentinel and see how he does. I don’t understand how you can execute two lots of Blade Dance one after the other? It’s showing that blade dance takes up 2 GCDs due to cast. The layout shows each GCD. Since Blade Dance spans 2 GCDs it is pictured twice. I think it is important to think and present this GCD by GCD as it shows the structure/timing inherent to the discipline. I wish you would just put the rotation in a normal format…. I don’t really understand what you are asking. I am seriously confused by the use of Blade Dance twice in a row. It takes 18 seconds for the ability to cooldown, how am I supposed to use it twice? It is not that ability is used twice, it’s because it is a long channel and it takes 2 global cooldowns. Only vigilance guardian can use blade dance 2 times in a row as plasma brand resets the cooldown of blade dance. In which case you still can’t use it twice in a row due to the fact that you have to use Plasma Brand to reset it’s cooldown. Do i use power or crit crystals? Noticed a few errors, Merciless Zeal and Plasma Zeal under the Discipline path have the wrong tooltips listed, Repelling blows is listed at lvl 16 but its lvl 32.Under the how to play section you say there are 10 essential abilities to the core rotation but Strike is listed twice at 9 and 10. Could you perhaps make a pvp gearing guide for Watchman? A Little bit difficult the Rotation of the watchman. Do I use the 4 cycles in a raw or can i choose one of the cycle based on the Situation ? And my Second question is in which sequences do I use Zen? Are there any pvp guides for the Sentinel? or is it just not worth it? What’s a good parse for a watchman sentinel in 216 min/max gear? How do you perform two blade dances in a row? You don’t, the pics are a little misleading, but I believe they have something to do with timing in the rotation regarding ability channels, this is especially important in an alacrity-oriented spec like Combat/Carnage. What is optimal alacrity for watchman? Ok because not many ppl understand the layout, this is how Blade Dance works, the double Blade Dance icon implies that it’s cast time last’s 2 global cooldowns. I perhaps didn’t read everything as I should be a couple points seem….short changed…in your guide. a. Valorous Call…is/how is it best utilized? b. Inspiration you speak to, how about Transendence and Force Might? c. You don’t use Blade Storm at all…intentional? 1. It depends if you are parsing or are you in a real boss fight. During boss fight when high group dps is needed you should use inspiration at the begining, then valorous call and Zen after 1st Melt. During parsing it’s better to use valorous call right after 1st Zen, which will allow you to use 2nd Zen right after 2nd Melt. In mid Combat you can use valorous and combine with attack adrenal and double Zen to increase DPS or to use Inspiration when there is a situational burn phase. Thank you for all your hard work on an awesome guide ! But please, correct all the mistakes contained like “rage”, “force rend” in important part of your guide, like the rotational tables etc. Other than this, again, awesome!